This is the second post in a collaborative series titled “Environmental Historians Debate: Can Nuclear Power Solve Climate Change?“. It is hosted by the Network in Canadian History & Environment, the Climate History Network, and ActiveHistory.ca. Climate change is here to stay. So too for the next several millennia is radioactive fallout from nuclear accidents such as Chernobyl and Fukushima. Earthlings will also live with radioactive products from the production and testing of nuclear weapons. The question as to whether next generation technologies of nuclear power plants will be, as their promoters suggest, “perfectly safe” appears to decline in importance as we consider the catastrophic outcome of continued use of carbon-based fuels. Sea levels rising 10 feet, temperatures warming 3 degrees Celsius, tens of millions of climate refugees on the move. These predicted climate change catastrophes make nuclear accidents such as the 1986 Chernobyl accident look like a tiny blip in planetary time. Or maybe not. It is hard to compare an event in the past to one in the future that has not yet occurred. I have found researching for the past four years the medical and environmental history of the Chernobyl disaster that the health consequences were far greater than has been generally acknowledged. Rather than 35 to 54 fatalities recorded by UN agencies, the count in Ukraine alone (which received the least amount of radioactive fallout of the three affected Soviet republics) ranges between 35,000 and 150,000 fatalities from exposures to Chernobyl radioactivity. Instead of 200 people hospitalized after the accident, my tally from the de-classified archives is at least 40,000 people in the three most affected republics just in the summer months following the disaster. We don’t have to focus just on human health to worry about the future of humans on earth. 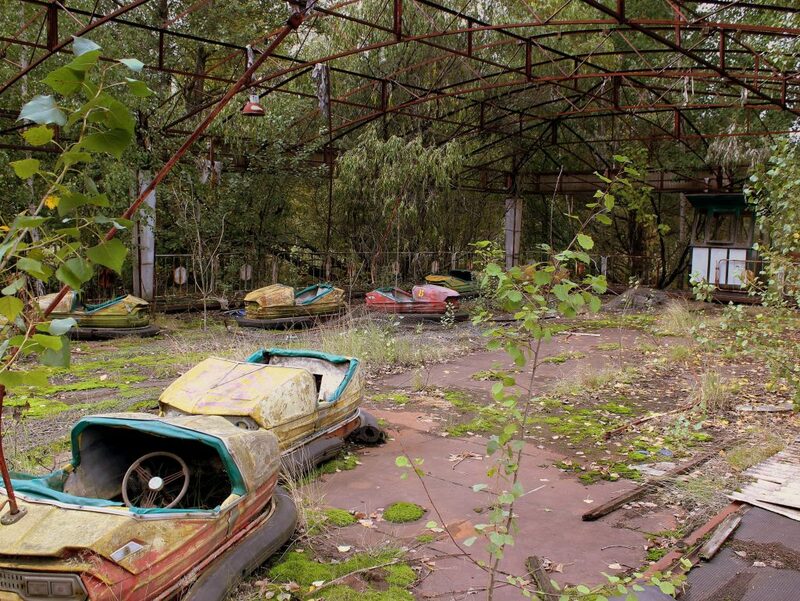 Following biologists around the Chernobyl Zone the past few years, I learned that in the most contaminated territories of the Chernobyl Zone radioactivity has knocked out insects and microbes that are essential for the job of decomposition and pollination. Biologists Tim Mousseau and Anders Møller found radical decreases in pollinators in highly contaminated areas; the fruit flies, bees, butterflies and dragonflies were decimated by radioactivity in soils where they lay their eggs. They found that fewer pollinators meant less productive fruit trees. With less fruit, fruit-eating birds like thrushes and warblers suffered demographically and declined in number. With few frugivores, fewer fruit trees and shrubs took root and grew. The team investigated 19 villages in a 15-kilometer circle around the blown plant and found that just two apple trees had seed in two decades after the 1986 explosion. ?1 The loss of insects, especially pollinators, we know, spells doom for humans on earth. ?2 There are, apparently, many ways for our species to go extinct. Climate change is just one possibility. Since Chernobyl, fewer corporations have been interested in building and maintaining nuclear power plants. In the past few decades, the cycle of nuclear power—building, maintaining, disposing of waste, and liability—has proven economically unfeasible and is winding down. Faced with intractable problems, regulations on classifying and cleaning up waste are being watered down. Westinghouse, the last U.S builder of nuclear reactors, went bankrupt in 2017. It was bought out and struggles to complete orders for its AP1000 reactors. Now China and Russia are the main producers of reactors for civilian power. We don’t know much about China’s nuclear legacy. We know Russia’s safety record is dismal. Meanwhile, in most countries with nuclear reactors, an aging population of nuclear power operators, nuclear physicists, and radiation monitors is not being replaced by a younger generation. Probably the greatest obstacle to backing nuclear power as an alternative fuel is that we have run out of time. The long promised fusion reactors promoted with the billion-dollar might of the likes of Bill Gates and Jeff Bezos are still decades in the future. Roy Scranton estimates in Learning to Die that we would have to have on line 12,000 new conventional nuclear power reactors in order to replace petro-carbon fuels. It takes a decade or two to build a reactor. Conventional and fusion reactors would come on line at a time when the major coastal cities they would power are predicted to be underwater. In short, for a host of economic and infrastructure reasons, nuclear power as an alternative power source is not an option as a speedy and safe response to climate change. It makes more sense to take the billions invested into nuclear reactors and research and invest it in research for technologies that harvest energy from the wind, sun, thermal energy, biomass, tides and waves; solutions that depend on local conditions and local climates. Nuclear energy is seductive because it is a single fix-all to be plugged in anywhere by large entities, such as state ministries and corporations. This one-stop solution is the kind of modernist fix that got us into this mess in the first place. Instead, the far more plausible answer is multi-faceted, geographically-specific, and sensitive to micro-ecological conditions. It will involve not a few corporations led by billionaire visionaries, but a democratized energy grid organized by people in communities who have deep knowledge of historic and ecological conditions in their localities. As they work to power their community locally, they will see the value of conserving, saving, and living perhaps a little more quietly. Kate Brown is a Professor of Science, Technology and Society at MIT. She is the award-winning author of A Biography of No Place: From Ethnic Borderland to Soviet Heartland; Plutopia: Nuclear Families in Atomic Cities and the Great Soviet and American Plutonium Disasters; and Dispatches from Dystopia: Histories of Places Not Yet Forgotten. She is currently finishing a book, A Manual for Survival, on the environmental and medical consequences of the Chernobyl disaster, to be published by Norton in 2019. 1 Anders Pape Møller, Florian Barnier, Timothy A. Mousseau, “Ecosystems effects 25 years after Chernobyl: pollinators, fruit set and recruitment,” Oecologia(2012) 170:1155–1165. 2 Jarvis, Brooke, “The Insect Apocalypse Is Here,” The New York Times, November 27, 2018, sec. Magazine. https://www.nytimes.com/2018/11/27/magazine/insect-apocalypse.html. How much have the radioactive products from weapons testing as well as Chernobyl and Fukushima increased levels of natural radiation?